How To Buy The Best Dehumidifier - Which? Looking for the best dehumidifier to help tackle condensation, damp and mould? We'll help you find the best dehumidifier for you. If you’re noticing water stains on your walls or ceiling, condensation on your windows, mould spores lurking in your shower or a general musty smell, it's time to buy a dehumidifier. Read on to find out what your options are. We'll help you avoid overspending or ending up with a dehumidifier that’s not suited to your needs. Take a look at our best dehumidifiers to discover the models that Which? recommends. Refrigerant and desiccant dehumidifiers - what's the difference? How much do dehumidifiers cost to run? What size or capacity dehumidifier should you go for? What features do dehumidifiers have? Use our interactive tool to understand which type of dehumidifier to go for, and discover some key features to look out for. Read below for more information on how to choose the best dehumidifier for you, as well as how much you should spend. Know what you want already? Head to our dehumidifier reviews. There are two main types of domestic dehumidifier - refrigerant and desiccant. As we explain below, they use different technology. Each type has its advantages. These work by creating a cold surface. When warm, damp air comes into contact with the cold surface, condensation forms and drips into the water tank. Refrigerant dehumidifiers are the most common type in the UK. They're generally only effective in a heated room in the house because, if the temperature drops too low, the coils inside them can freeze over. However, we've found some that work well in lower temperatures, too. Desiccant dehumidifiers use an absorbent material to extract water from the air, in a similar way to a sponge. The desiccant is regenerated by an internal heater, and the moisture drips into the water condenser. Desiccant dehumidifiers will often work more effectively than refrigerant dehumidifiers in colder temperatures of 15°C or less.That's because refrigerant dehumidifiers work best at higher temperatures and higher humidities. The inside of a refrigerant dehumidifier needs to be colder than the air within the room - and the colder the room, the harder the dehumidifier has to work to create that cold surface. So, if you're looking for a dehumidifier for an unheated garage, conservatory or other out-building, you should generally opt for a desiccant. That said, we've found some versatile refrigerant models that work fantastically in chilly conditions. Head to our dehumidifier reviews to see the best and worst dehumidifiers of both types. 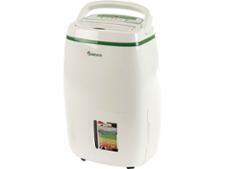 Dehumidifiers can cost anything from around £40 to £450. The amount you spend largely depends on the dehumidifier’s capacity and any extra features it comes with. If you’re already spending plenty on heating, having to fork out for a dehumidifier can feel like a kick in the teeth. So can you get away with a cheap one? There are a few factors to consider. The cheapest dehumidifiers usually have a smaller capacity. Dehumidifiers that cost less than £130 tend to have a capacity of 10 litres or less. Cheaper dehumidifiers also tend to have fewer features than more expensive ones. A cheap dehumidifier is less likely to have wheels or a laundry setting. Most dehumidifiers have a built-in humidistat or auto setting regardless of price, however. And most have a digital or analogue display, although a handful just have an on/off switch. Cheap dehumidifiers aren't necessarily less reliable than more expensive ones. We asked more than 500 dehumidifier owners to tell us how long their machines had lasted, and what had gone wrong if they broke down. As a general rule, dehumidifiers were rated highly for their reliability, meaning they’re unlikely to develop faults. The dehumidifier brand that was rated least reliable still had 72% of products staying fault-free after six years – which is better than many other home appliances. You'll need to spend at least £130 to get a reasonable dehumidifier: those we've tested below that price haven't proven very effective. Beyond that, though, there isn't any correlation between price and performance. One dehumidifier we tested, for example, costs £250 but scores only 50%, while another cost £145 and is good enough to be a Best Buy. The good news is, you probably don't need to worry too much about a dehumidifier adding enormously to your energy bills. A 250W dehumidifier, running for four hours at a time, twice a week, should cost around £19.50 a year to run. That said, some are much slower at extracting water from the air than others. This means you’ll have to use them for longer, which will increase the amount of energy you use. A dehumidifier's size or capacity describes how many litres of water it's able to extract from the air each day, rather than its physical size or the capacity of its water tank (although dehumidifiers with a larger extraction rate are often larger and contain larger tanks). The best-sized dehumidifier for your needs depends on the size of the space you want to use it in. As a general rule, if you're looking for a dehumidifier to dry out your whole home, you'll need a model with a larger capacity. You can use the following table to to get an idea of what capacity dehumidifier you need. These figures are just here to get you started, though. Bear in mind that two dehumidifiers with the same capacity claims could vary enormously in performance, so the only way to be sure is to check our reviews. You should also bear in mind that manufacturer claims about capacity (water extraction rate) are often based on conditions you're unlikely to experience in your home. For refrigerant dehumidifiers, manufacturers frequently base their claims on 30ºC and 80% relative humidity - conditions which better represent a tropical rainforest than a typical British home. That's because the higher the temperature and the higher the humidity level, the more effectively a refrigerant dehumidifier will work. So, if a dehumidifier has a capacity of 18 litres, this doesn't mean you can expect it to extract 18 litres of water a day from your home. If you've got a tiny home, you won't want a great, hulking dehumidifier taking up precious square footage. The smallest dehumidifiers have a capacity of 7-10 litres, though you'll see many more at 10 litres than 7 litres. Size wise, these smaller models will range between 18cm x 38cm x 18cm, and 36cm x 55cm x 33cm (w x h x d). Continuous drain facility Many dehumidifiers allow you to connect a hose and flush the collected water directly away to a low-level drain. This will save you from emptying the water tank yourself, or prevent the machine from getting full and switching off if you're not around to empty it. Dehumidifiers with this function often don’t come with a hose in the box, so you’ll have to buy it separately. Frost watch Technology that prevents water from freezing on the coils. Most refrigerant models should have this, but its's worth checking. Desiccant dehumidifiers don't need this, as they work differently. Auto setting or in-built humidistat This monitors moisture levels in the air and adjusts the dehumidifier to maintain the humidity level you’ve selected. This saves you from repeatedly turning your dehumidifier on and off, as it automatically knows when it needs to work hardest. Head to our dehumidifier reviews to find the models with an effective auto setting. Integrated cord storage For saving space when the dehumidifier isn’t in use, and removing the risk of tripping over a sprawling cable. Not an essential, but nice to have. Timer Allows you to programme the dehumidifier to turn on and/or off after a specified amount of time. This could help you save money if you're on a tariff offering cheaper energy at certain times of day. However, you may find a humidistat more useful. Laundry setting Useful if you don’t have a tumble dryer and it’s too cold to dry clothes outside (or if you don’t have access to a garden or balcony where you could hang your washing). Hanging clothes on a radiator can cause condensation. Manufacturers say that a dehumidifier will leave your clothes softer than a tumble dryer would, as it doesn’t use heat. Wheels/castors Could come in useful if your dehumidifier is heavy - they can weigh from 6kg to more than 16kg. We’ve tested a range of dehumidifiers from different brands, including Ebac, Meaco and DeLonghi, to uncover the best dehumidifiers that are worthy of our Best Buy dehumidifier recommendation. 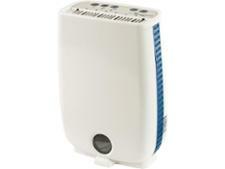 The Meaco DD8L is a small, lightweight dehumidifier that’s easily portable. It’s great for warm and cold rooms and, unlike some, it’s not noisy. This dehumidifier is equally effective at room temperature and at low temperatures. It's also energy-efficient and easy to use. It has setting for drying clothes, too. An older dehumidifier but still one of the best we've tested. It's effective at room temperature and at chillier temperatures, and it works very quietly compared to others we've tested. 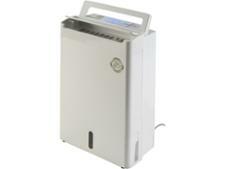 This desiccant dehumidifier works well in warmer and cooler environments. You won't find it difficult to use, either. The only drawback is the noise it makes. This dehumidifier does a great job of tackling humidity at room temperature (it’s not ideal if you’re looking for a dehumidifier for chillier conditions - an unheated garage, for example). It runs quietly and it uses just a small amount of energy.